The Sporegrub (オッコ?) is an enemy found in Hey! Pikmin. 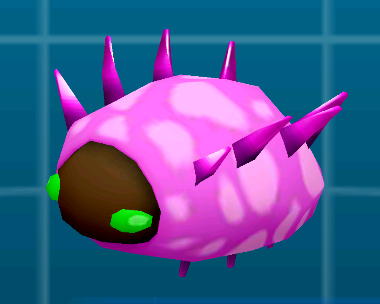 According to Olimar's notes, it is a mutated variant of Sheargrub. It's smaller than other mandiblards, about one third the height of Olimar. They are mostly pink with light spots, but have green menacing eyes and a brown face. They climb down from vines, and eventually fall on the ground, ready to attack Olimar or his Pikmin. They are quite a rare enemy, only appearing in two areas. To do: Describe its behavior when it sees Pikmin, when it attacks, when it shakes, when it loses interest, etc. Steel Pipe Forest: This is where they are the most frequent, acting as the "gimmick" of the level, being found throughout the whole area. There are lots of twisting vines all over the level, allowing them to quickly travel around. Burning Bog: The first notable place they are found in is the room with the Tangerine Paste. They act as a threat that distracts the player, crawling from the ceiling from multiple vines. Here, the player must multitask between fighting the Puffstalk in the room and the Sporegrubs. They also appear a few times throughout the level, and they can land on the player's "raft" and overall cause more chaos. To do: Add a guide on how to beat it. This page was last edited on January 24, 2019, at 16:46.